Two years ago today, I did my first podcast. I called it an "audio Morning Coffee Notes." Orcmid welcomes himself to the OPML Editor. Jeff Sandquist was Scoble's boss at Microsoft. Doc Searls: "Scoble may turn out to have been the most human resource Microsoft ever had." Fred Wilson: "I think something is wrong with the link counting system that Technorati uses." The Internet, it's fantastic and scalable! Windows Vista is available via BitTorrent. Via TC. I'm downloading a copy and seeding it here, just to help the community. It's a perfect illustration of something we want Microsoft to see -- get embraced and extended by the blogosphere, instead of the other way around, and all kinds of goodness follows. Right now, as I write this, there are only 2 seeds. By the end of the evening there should be hundreds. Chris Pirillo says it's "100 percent true" that Scoble is leaving Microsoft and joining Podtech. I've been hanging with Scoble all day, had dinner with him and John Furrier last night (also Jason Calacanis, Leo Laporte, Steve Gillmor, Janice Fraser, Maryam Scoble, Chris Alden and Amber Dawn MacArthur). I've been all around this deal, so close to it, it's hard to comment. I'm glad that Scoble and Maryam will be moving back to the Bay Area, I've been encouraging them to try the East Bay. I'd like to see Furrier open a studio in downtown San Francisco, I have some ideas about that, and may open one myself, or use theirs. I think the new media that's formed around RSS 2.0 with enclosures has become even more interesting. 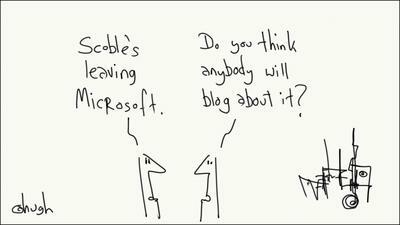 And it'll be great to have Scoble back, in more ways than one. It's too bad Microsoft couldn't bend more. I know that sounds arrogant, but I'm not modest about the changes brought about by blogging, RSS, podcasting, unconferences, etc. I've said it before, it's not possible for Microsoft to embrace and extend this time, yet that's how they're playing it. It's more likely to happen the other way, RSS will embrace and extend Microsoft, but I guess Microsoft is going to put that day off even further into its future. It's already way late to acknowledge that the ideas that are shaping technology aren't coming from Redmond, they aren't even coming from companies. A person like Scoble can have enormous influence just by adopting some very simple ideas. It's the ideas that have power. But Microsoft hasn't let the changes waft over them. They still think in old terms. I'm glad to see my old friend didn't go down with the ship. Last update: Sunday, June 11, 2006 at 11:49 PM Eastern.